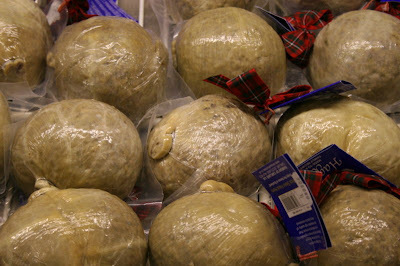 Ananka's Diary: There's a Ban on Haggis?!? Haggis (shown above in all its glory) is a delightful Scottish treat. According to Wikipedia, it's made from "sheep's 'pluck' (heart, liver and lungs), minced with onion, oatmeal, suet, spices, and salt, mixed with stock, and traditionally boiled in the animal's stomach for approximately three hours." And I have to say . . . it's really good. (Sorry, veggies.) But apparently it's been banned in the US since the outbreak of mad cow disease in Britain. (Which was quite some time ago.) Now the Scots are planning to lobby the US government to lift the ban. They seem to think that lots of people in America are craving a little sheep stomach surprise. I'm not sure about the rest of my countrymen (and women), but they can put me down for a serving or two. In the meantime, maybe I'll try vegetarian haggis--or this tasty product. Thanks for the story, Elizabeth! How did you have it if it's banned? I guess you have "ways." LOL. LOL. I remember a while back we were talking about the different "Kiki Strike" books covers. Here's some cool ones! One of the covers I found was next to a "Winnie the Pooh" book. =( LOL. I also found a bunch in German.. The gummy tapeworm actually does look good, though! I agree with international mastermind, that tape worm does look good. I wonder if the lobbying will work. Lobbying almost always works at one of the schools I go to, so it might. I don't think there's been any lobbying for haggis at the school (no one probably knows what it is). Definitely the wrong newspaper section. Excuse me: Studying cows belching. Same Anonymous: Where's your blog? I can't seem to find the URL. I changed my blogger picture. Does it look familiar? Here's some cool Toledo news. There's a frog in my salad! Spring: Thanks for finding the covers! I think Kiki and Winnie go well together. And thanks for the links, too. I've got a lot of surfing to enjoy! Elizabeth: You're a powerhouse! You guys are fabulous. I'm going to go check everything out now. Spring: PS, love the pic! im no vegatarian (although half my family is) but I would NEVER IN MY LIFE eat something as disgusting as that. I mean, Im grossed out by eggs, so haggis nearly has me choking... I think I might look into becoming a vegatarian after all. poor Scottish enthusiast's, what will they do w/out their cultural delicacy?